From Queen of Thorns to Mistress of Robes! 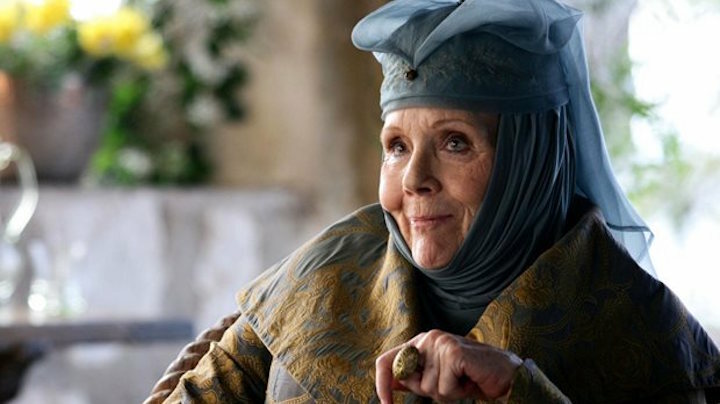 Dame Diana Rigg leaves her Game Of Thrones character Lady Olenna Tyrell behind as she makes her debut appearance in series two of Victoria, starting on ITV Choice on Monday 4th September. For the 79-year old Rigg, being able to laugh at her character's general disapproval really drew her to the role of the Duchess of Buccleuch in the hit series that stars Jenna Coleman in the titular role and Tom Hughes as her husband Albert. When asked what she likes best about the duchess, Rigg said "I love her candour, the fact she is straightforward. I like the fact that I don’t think she would lie - she is what you see. She is a very efficient sort of woman, but then so am I so we have that in common. "Olenna Tyrell was not the sort of person who behaves in an acceptable fashion just to be accepted, she very much goes her own way, and I hope that she encourages young women to be the same. But Dame Diana admits her character has some lighter moments, "There has to be a bit of comedy and I try to find it in every scene. It is not exactly laugh out loud, but the writer Daisy Goodwin is wonderful and she has given me some terrific lines. The duchess is great fun to play." The Duchess of Buccleuch was Queen Victoria's Mistress of the Robes. Dame Diana explains how they first become acquainted. Thankfully Rigg did not have to endure the restrictions of a corset while filming Victoria.